Copyright Notice: Miraculous™ is a trademark of ZAG™ - Method™. © 2018 ZAGTOON™ - Method™ - All Rights Reserved. These are the official Miraculous™ - Ladybug & Cat Noir licensed characters, Miraculous™ - Ladybug & Cat Noir. ZAG HEROEZ – MIRACULOUS™ – Tales of Ladybug & Cat Noir follows the adventures of two seemingly typical teens, Marinette and Adrien, who have secret identities and transform into superheroes, Ladybug and Cat Noir, when evil threatens Paris. Marinette is positive and enthusiastic. With the help of her Kwami, Tikki, and the magic words “Spots On!” she transforms into her alter-ego – Ladybug – ready to defend wrong-doing! Ladybug is brave, quick-thinking and stays focused on her missions until they are accomplished. Her Lucky Charm power makes ladybugs swarm from her yo-yo forming a special object to help fight crime. Like Marinette, Adrien was chosen to fight villains. With the help of his Kwami, Plagg, and the magic words “Claws Out!” he transforms into Cat Noir! Cat Noir is liberated, strong and confident. His super power is ‘Cataclysm’, where his ring becomes energized and allows him to impose chaos on anything he touches. Cat Noir is in love with Ladybug and sometimes tries a little too hard to impress her. ZAG HEROEZ – MIRACULOUS™ – Tales of Ladybug & Cat Noir is a hit, 3D-CGI animated action comedy TV series, airing in over 120 countries worldwide. The eagerly anticipated second series of Miraculous is launching onto Pop around Easter 2019. 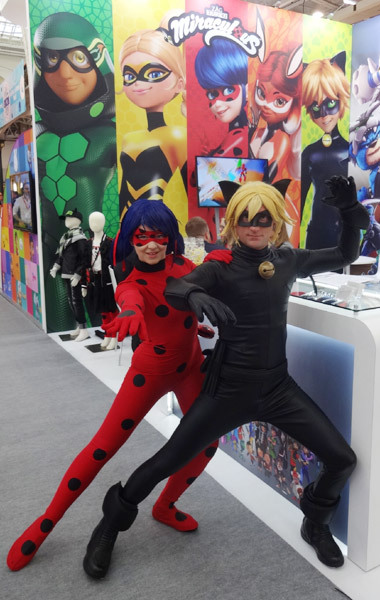 Ladybug & Cat Noir are available to book to make personal appearances at UK events.